"Temperance”, Tarot de Marseille, Jodorowsky & Camoin. In the world of transfinite cardinality, any talk of number density, dart-board hits, proportions, or probability is just a pouring from the empty into the void. The reader is immediately presented with a demand—notwithstanding factors governing the ability to assess outcomes, even including the Heisenbergian suggestion that observation and the material of attention itself exerts influence—to ponder this potent formulation together with its parts. What is the empty? What is the void? And what pours between? But who has time to ponder? Sure, we think about things, which means gauging whether a subject is met with agreement/disagreement, acceptance/rejection, or some similar reptile-brain dyadic assignment. Or, lacking sufficient energy to make a snap judgment, we are prone to grab the device and look up the object of inquiry on the internet. This is no good, for real pondering requires not only time but also self-reliance and an attention that is at once sharp, flexible, and persistent. Still, in certain cases, when the need or desire for knowledge is great enough, when no shallow appraisal will suffice, and a real answer is a genuine necessity, to ponder is a choiceless step. In the face of Mr. Seton's offhand expression—just a pouring from the empty into the void—I find myself faced with such a necessity. Initially, I am distracted by the strange fact that Mr. Seton would use a probabilistic analogy, an instrument he claims to disdain, to indicate his disdain. My mentation admits this inverse application may be a lawfully appropriate usage, and I proceed with the inquiry. At this point I am reminded of the ramen-eating master and his student as they sit before steaming bowls of noodles in the film Tampopo. Old gentleman: No. Just touch it. Caress it with the chopstick tips. Gently pick it up and dip it into the soup on the right of the bowl. What's important here is to apologize to the pork by saying "See you soon." Finally, start eating—the noodles first. Oh, at this time, while slurping the noodles, look at the pork. In pondering I feel called first to gather a critical quantity of known material, and then summarily but courteously set it all aside to make a deeper inquiry. What is the empty? As its opposite, the concept itself evokes an image of fullness. There is always and in everything an inverse proportion of the two. Before me sits a cup of coffee, one quarter empty. Or is it three quarters full? Which is it? Or is it both simultaneously? To realize emptiness is to accept that emptiness and fullness are inseparable. What is the void? The casual view is to see empty and void as synonyms but a brief deeper look reveals two things with shocking clarity. First, the casual view generally at work in me is woefully ignorant. Second, the void is at least one, possibly infinite dimensions greater than emptiness. The void is neither empty nor full. Truly the void is not either this or that, nor is it both or any thing at all. It has no space, no time, no thing and yet not no thing. There is no relativity in the void. It is what philosophers lamely label as the absolute, and the authors of old scripture called the ineffable name. Faced with the unfathomable, I must pause here to take a few breaths. I see that full comprehension of the void would instantly annihilate all trace of my identity. To this realization, I say "See you soon" and continue the inquiry. What is poured from the empty, into the void? 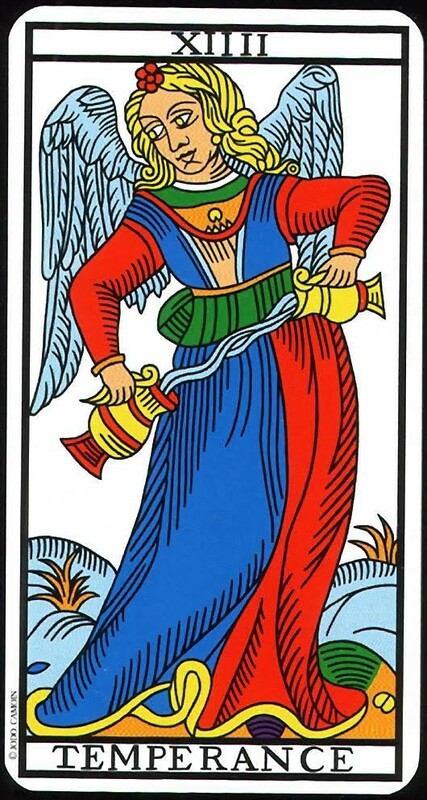 The immediate association is the image of the 14th card of the Tarot's major arcana—Temperance. Here an angel is shown holding two goblets with a tether of substance flowing between. Though winged, the angel is firmly planted on earth. Her yellow eyes focus intensely on the task. There's a ferocity in her presence, suggesting, as in a verse from Rilke, "All angels are terrifying." What is poured is the stuff of the phenomenal realm of appearances, the emptiness of maya, the world of dualities, into the illimitable world of absolute source, and back again, in a process that is not in time, nor is it eternal. Rather it proceeds in a vast solid state of simultaneity. Finally, I hear a mysterious phrase, in the voice of silence: To know is to know all. With thanks to Mr. Seton for this chance to begin to inquire, I now realize he did not use the word "just" to diminish the meaning, but rather in the opposite sense of the word.